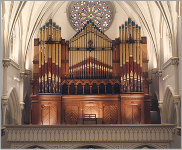 Andover Organ Company has recently completed its largest organ rebuilding project ever, the Centennial Organ at St. Joseph Cathedral in Buffalo, New York. Bishop Henry J. Mansell, Monsignor James F. Campbell, and Organist Mark DiGiampalo of the Cathedral have worked closely with Donald H. Olson, president, and Robert C. Newton, tonal director, of Andover over a number of years to devise a plan for rebuilding and expanding the Organ while retaining the original tonal concept. 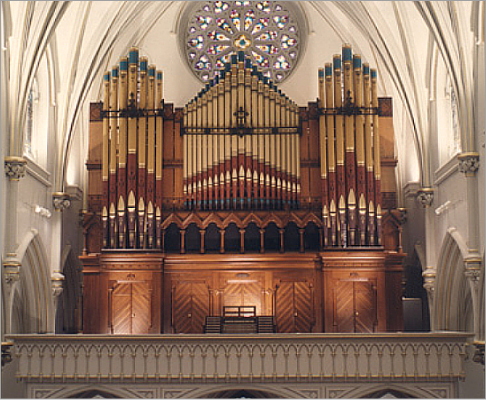 This particular organ was designed and built for the 1876 Centennial Exhibition in Philadelphia, Pennsylvania. The base of the organ case consisted of multiple doors, through which the public entered passageways into the instrument. The company wrote, "...hundreds traversed its passages daily, whose knowledge of an Organ up to that time consisted of the fact that it had pipes and a bellows and there they received the first knowledge of its parts and construction and the wonders of its mechanism." It was awarded the highest rank in its class by the Centennial Commission which presented E. & G. G. Hook and Hastings with the Judges’ Award. After the Exhibition, it was purchased for $10,000 by the Bishop of Buffalo. Major changes were made to the organ by Tellers-Kent Organ Company of Erie, PA, in 1925, and by Schlicker Organ Company of Buffalo in 1976. By 1996, the organ was virtually unplayable during the winter months and a decision of whether to replace it or rebuild it was imminent. 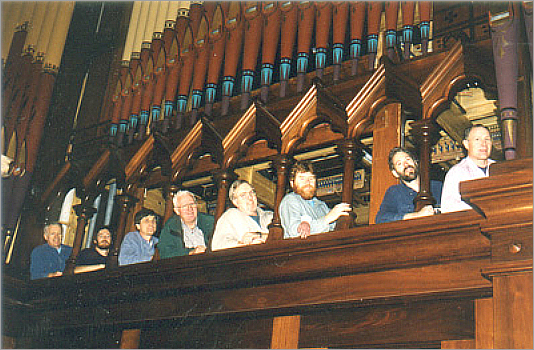 In 1998, the Cathedral decided that "the organ need not be replaced, but rather completely rehabilitated." At the same time the tonal palette needed expanding to better serve the needs of the Conciliar liturgical reforms, and to allow for use in concerts and recitals. 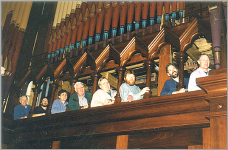 In July 1999, a team from Andover dismantled the organ, loaded it into two moving vans, and transported it back to Lawrence, where 18 employees labored for more than a year to clean, repair and expand the instrument. In September 2000, it was returned to Buffalo. Extensive regulation and tuning followed over the ensuing months. The dedication by organist Thomas Murray is slated for June 11, 2001. In undertaking this immense job, Andover sought to retain and restore as much of the original as possible. We have long been associated with the work of the Hook firm and have based our own new instruments on those of Hook. Robert C. Newton, our Tonal Director, is a well known authority on Hook organs and their voicing. Additions are voiced in the Hook style and are copied from, or are, Hook pipes. We have researched compatible organs to develop scalings appropriate for the additions to the St. Joseph organ. The Choir is no longer enclosed, the Swell box is back to its original size, and the Solo is restored to its original position. Many of the missing and added pipes have been replaced with pipes from the Cincinnati Music Hall mixtures. We feel that the organ is now far closer to the original than it has been since the 1923 electrification and rebuilding. First, the entire organ was cleaned, and the black walnut case stripped of coats of varnish stain and restored to its original finish. All existing chests and pipework were rebuilt and repaired. Manuals were expanded to 61 notes and pedals expanded to 32. Existing reservoirs were releathered and two new ones constructed. A new floating Celestial Division on a slider windchest was added. This division is based on the more usual E. & G. G. Hook solo division as typified by the organs in the Cincinnati Music Hall and Mechanics Hall, Worcester. There is an 8’ Philomela copied after Immaculate Conception, Boston (labeled Concert Flute at Immaculate), an original Hook 4’ Hohlpfeife, a 2’ Harmonic Piccolo, a Cor Anglais, and a few fun stops such as the French Horn, Dolcan Gamba with Gamba Céleste, Spitzflöte and Spitzflöte Céleste, but then the original stoplist has the Stentorphon. We believe that it is the first instance of this stop being used by any builder. Hook & Hastings later made French Horns which were very highly regarded by Audsley. The original pitch was approximately A=449. At the time we first examined the organ, the pitch had been lowered to approximately A=444. It was a conscious effort on the part of past rebuilders who rolled up the scrolls and coned in the pipes drasticaly and lowered the wind pressures to accomplish this. Andover's lowering the pitch to A=440 (at 65 degrees at balcony level) made the scales of the Principals and many flutes somewhat smaller. Many of the strings and some flutes were rescaled one pipe larger to lower the pitch. The issue of pitch became important enough in the 19th century that the Cincinnati Music Hall organ was rescaled one pipe larger, probably by Hook & Hastings, to lower the pitch, as was the Mechanics Hall organ. Francis Hastings, himself, lowered the pitch at Immaculate Conception Church, so there is a precedent for this.